Ranchi, Aug 30 (IANS) Rashtriya Janata Dal (RJD) chief Lalu Prasad on Thursday surrendered in a special CBI court here as the Jharkhand High Court had directed. Lalu Prasad surrendered in the court of Judge S.S. Prasad, who sent him to the Birsa Munda Central Jail in Ranchi, where he had been lodged earlier after his conviction in several fodder scam cases. 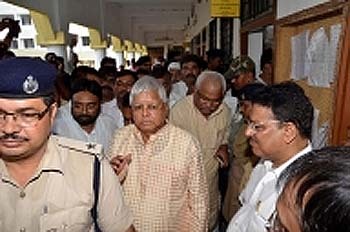 In the afternoon, the former Bihar Chief Minister was shifted to the cardiac centre of the Rajendra Institute of Medical Sciences after a medical check-up and advice by a team of jail doctors. Out on provisional bail since May 11, he was directed by the High Court on August 24 to surrender by August 30. Speaking to the media before surrendering in the special court, Lalu Prasad said: "I have faith in the judiciary." The RJD leader is suffering from ailments related to kidneys, blood pressure and sugar. RIMS Director R.K. Srivastav told the media that a medical team will be constituted on the basis of a report on the health of the former Union Minister. A hospital dietician had been instructed to prepare a diet chart for the RJD leader as per his health condition, he said. In 2013, he was convicted in the first fodder scam case and sentenced to jail for five years. He was also convicted in December 2017 in a fodder scam case, apart from two similar cases in January and March and awarded 14-year imprisonment. The multi-million fodder scam surfaced in the 1990s when Lalu Prasad was the Chief Minister of undivided Bihar. The Central Bureau of Investigation probed the cases on Patna High Court orders.